Last weekend saw Shinzo Abe’s LDP party re-elected in Japan, an anti-EU party elected in the Czech Republic, and autonomy votes in Northern Italy. Also the Catalan crisis rumbled on. 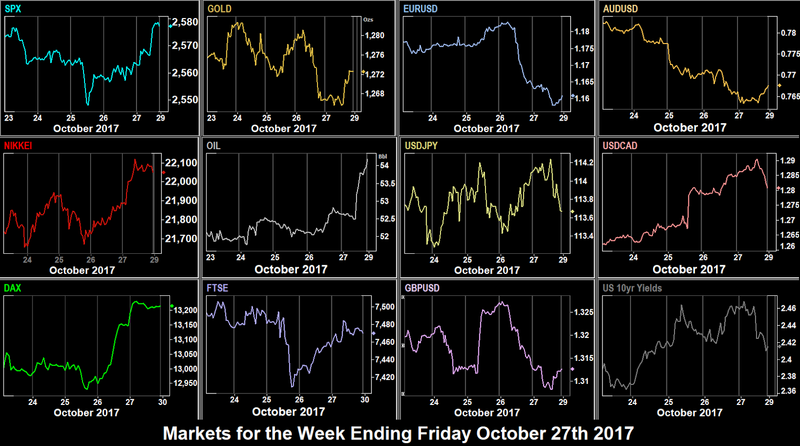 The Japanese election gave NKY a brief boost to a 21 year high in the Monday Asian session, and USDJPY touched a 15-week high, but as Europe opened, markets were in risk-off mode. All indices were down by the end of the day, and only Gold and JPY were up. Other currencies all faded slightly against USD, and Oil was flat. Interestingly, the Brent/WTI spread narrowed by 0.8% to $5.50. Tuesday saw a sharp rise in NKY to a fresh high. European indices rose slightly after mixed German (0730) and Eurozone (0800) PMIs, and SPX was largely flat. However the DJIA hit a new intraday all-time high after strong earnings by Caterpillar (3.91% of DJIA) and 3M (6.52%). In currencies, EUR crept up slightly in the run-up to Thursday’s rate and QE decision, but other currencies fell against USD, especially NZD, which hit a five month low as the incoming government said it planned to reform the Central Bank mandate. Similarly yields were up and Gold was down. Oil had a lacklustre 50c rally. Wednesday saw equity markets take a breather. 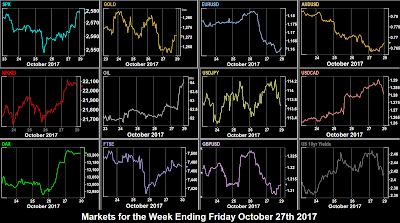 All markets were down, SPX posting its worst day for over a month, despite beats in Durable Goods (1230) and the Housing Price Index (1300). Other markets followed suit, particularly FTSE which reacted to the GBP movement. In currencies there was more volatility than we have seen for a while, due to three major releases. In the Asian session, there was a miss on Australian inflation at 0030, which send AUD tumbling 0.94% on the day. Then at 0830, the UK GDP beat made traders feel next week’s rate hike was a near-certainty, and the British pound put on 0.95%. in three hours. Finally we had the Canadian rate decision. Although another hike after last months 0.25% increase was very unlikely, the effect of the hold print was an immediate 1.1% rise in USDCAD. Unsurprisingly the risk-off note to equities meant that, after spikes down, Gold, JPY were up. Money has to flow somewhere. Otherwise EUR was up and NZD was down, continuing the same trend as Tuesday. Visa (3.22% of DJIA, not 8% as reported last week), and Boeing (7.54%, not 4.66%) both reported earnings beats, but this didn’t affect the overall mood. Oil eased very slightly on the day. Bond yields were initially up, at one point touching a seven-month high. They faded but still ended the day up. This means that in one day money rotated out of stocks and bonds into safe haven assets, and then some of that money went back into bonds. It was business as usual on Thursday, and indices were up again. DAX had its best day since Sep 11th, putting on nearly 200 points (1.5%) to finish at an all-time high on EUR weakness. Other indices were similarly impressive, recovering Wednesdays losses to varying degrees. IBEX benefited from both the euro, and hopes that the Catalan president might pull back on secession plans. At 1145 the ECB announced, as expected, the tapering calendar for QE, saying it will last through 2018, and rate hikes may not appear until 2019. Most of the announcement was expected, so the fall in EUR was not instant. However, it slowly sold off all day, finishing 162 pip (1.38%) down. The dollar had a very strong day across the board, on reports than (dove) Janet Yellen was now out of the running for the Fed Chair position, forcing GBP and JPY to give up all of their Wednesday gains. AUD was down as the Australian government had lost their majority due the High Court deciding that their deputy Prime Minister being ineligible to sit in parliament as he has dual nationality. Gold and bond prices were down in line, as was CAD, despite Oil putting on about 50c. AMZN, GOOGL, MSFT and INTC all reported after the US bell Thursday. All four beat estimates, and NDX immediately rose 60 points (1%), and finished Friday 126 points (2.08%) up. The day saw strong beats (at 1330) in US YoY GDP (3.0% vs 2.5%) and QoQ PCE (1.5% vs 1.2%), which pushed all indices up. The print was particularly impressive given the recent hurricanes. SPX, NDX and DAX closed at all-time highs again, and NKY at a 21-year high. The DJIA was weighed down by Chevron (3.51% of the DJIA) which fell 4.2%, who reported a decline in output (despite beating revenue and EPS estimates). The other loser was IBEX as it became clear that Catalan President Puigdemont was going ahead with his illegal independence declaration, forcing Madrid to take unilateral action. After a very strong day for USD on Thursday, DXY was nearly flat on Friday, managing only a 9c (0.1%) gain, driven mainly by continuing EUR (and to an extent GBP) weakness. Despite the stocks blowout, the classic indicators of risk-off were surprisingly present (Gold, JPY and bond prices all up), and even beleaguered AUD and NZD posted green candles for the day. However, the 2-year bond yield hit a nine-year high of 1.63%. It was notable that oil rose sharply to a six-month high on further speculation that OPEC cuts will be extended, adding 2.43% for the day, and 4.15% for the week (and CAD followed suit). Signs perhaps, as on Wednesday, that we are seeing brisk intermarket rotation. Over the weekend, we saw Spain implement their direct control of Catalonia, following the regional president’s refusal to back down. This was expected, so it remains to be seen what will actually happen. Markets generally ignored the statement by special prosecutor Robert Mueller that charges have been filed in his Russiagate investigation. Notably President Trump’s Twitter account has been uncharacteristically quiet. Note also that Daylight Savings Time in Europe (including the UK) has ended, but does not end in the US until next weekend. This means that, for Europeans, all US events are an hour earlier than usual. Don’t forget! Tuesday brings the BoJ Rate Decision. JPY touched long-term support last week, and anything hawkish could bring significant downside for USDJPY. A double Eurozone whammy of GDP and CPI is released at 1000. This allows us unusually to calculate disinflationary growth by deducting one from the other, which is est 1.0%, prev 0.8%. CPI growth is more important than GDP as a positive for EUR. Canadian GDP is less important. Although loonie hawks were clearly looking for a rate hike last week, the next decision is not until Dec 6, and we have the Canadian jobs report, another GDP and CPI print, and a speech by Gov Poloz between then and now. Another FTSE heavyweight, BP (4.8%), reports before the UK open. If that wasn’t enough, the week really starts on Wednesday. The ADP report estimate is a huge 75k lower than the NFP estimate. A miss would be startling. After that is the key figure of all PMIs, the ISM Manufacturing figure and prices paid, a forward indicator for growth. The Fed announcement is expected to be a rate hold (CME Fedwatch give that a 98% chance), with an indication of a rate hike in December. However, this could be Janet Yellen’s last appearance, and so the accompanying statement will be watched carefully. Note also that this is the day that the draft tax bill is due to be released. The question of course is how much of the benefit is already priced into the markets, which are of course at all-time highs. The ‘high tax’ index of stocks is still lagging the SPX. Finally, we have Facebook (3.41% of NDX, 1.84% of SPX) and TSLA (0.75% of NDX) both reporting after the bell. We saw what happened to Amazon last week. If FB performed similarly that would translate to 27 points in NDX. TSLA of course is not a large component, but a miss has the potential to move the stock by a huge amount. Thursday will also be volatile as President Trump is scheduled to announce his decision for the Fed Chair. The current consensus is that he will pick either current Governor Jay Powell (a continuity candidate). The second favored candidate is John Taylor (a hawkish outsider and author of the ‘Taylor Rule’). Reappointment of Yellen is considered an outside chance. The political spread betting site PredictIt rates Powell at 78, Taylor at 13 and Yellen at 10. A Taylor or Yellen appointment should therefore depress USD and bond yields slightly, whereas a Taylor appointment may cause a bigger move to the upside. One possible scenario being mentioned is a Powell appointment with Taylor as vice-chair. This should also be positive for USD. In the UK, a doubling of the base rate to 0.50%, the first increase for ten years, is expected at 1200 following mostly hawkish central bank comments and good data over the last couple of months. The overall trend for GBP is still bearish, and the hike is largely priced in. We saw last week how the spike up on UK GDP beat faded within 24 hours. We may see a similar price/action pattern here, especially if the MPC vote is less than 6-3 in favour. Obviously if the decision is a hold, cable should fall substantially. Also in the UK, Royal Dutch Shell (two stocks RDSA and RSDB, totalling 9.8%) of the FTSE report earnings before the open. To finish the day, AAPL, the world’s biggest company reports earnings after the bell. AAPL is 11.84% of NDX, 4.79% of DJIA and 3.70% of SPX. The pace continues unabated on Friday with the US and Canadian jobs reports. The US estimate of 300k is the highest for many years, after last month’s first time contraction for years. The Canadian estimate is much less ambitious at 14.5k (equivalent to 130k in the US relative to populations. Given everything else that has happened this week, and the reduced effect of NFP on the markets, compared to, say, three years ago, we don’t expect anything momentous, unless of course, there are big surprises. We will focus on USDCAD at the time of the release, other markets will depend where we are by then. The following weekend sees US Daylight Savings Time end, to realign with Europe.